For the little time I was a stay-at-home mom before I started working from home I would cringe at the thought of going back into the workforce. How was I going to compare my stay-at-home mom skills to someone who has proper training? One afternoon I was fixing dinner and watching Reba. I loved that TV show! Anyway, the episode was about her character going back to work after being a stay-at-home mom for so many years. Can anyone relate to that scenario? In one scene she’s at the employer’s office and she’s interpreting her skills as a stay-at-home mom to the skills needed to run an office. And I was like ding, ding, ding! A stay-at-home mom has just as many skills as an administrative assistant, customer service rep, or even an office manager. So while I was chopping up the veggies, I started doing a little translating myself and this is what I came up with. When a mom can get the kids to school before the bell rings without getting a speeding ticket, that, my dear, is some serious time management skills. When a mom can get the kids to practice and make it home on time to get dinner on the table, she is rocking some organizational skills. Most moms are in charge of making sure the bills are paid on time and the checkbook is balanced. When she does that, she’s wearing her bookkeeping skills hat. When a busy mom can cook dinner, wash clothes, and manage her online business we’re talking some major multi-tasking skills. When a mom doesn’t like her kids, yet still loves to spend time with them, she is definitely getting along well with others. When you get past the house chores and carpools stay-at-home moms have the skills employers are looking for and that makes her just as qualified a candidate as the next person with office experience. So what will be the deciding factor between you getting the job versus someone with office work experience? That would be your resume and how you present your homemaking, or as I like to call it, domestic goddess skills. Remember it’s the person with the right kind of skills and attitude that will be recognized. Here are some things to keep in mind. Keep your resume professional and avoid terms like “taxi-driver” to describe driving kids to school or practice. And avoid using “domestic goddess” as your last job title. Don’t overlook any volunteer work you’ve done at school or church. And if you’ve been a “room mother” for your kid’s classroom, describe how you assisted the teacher. 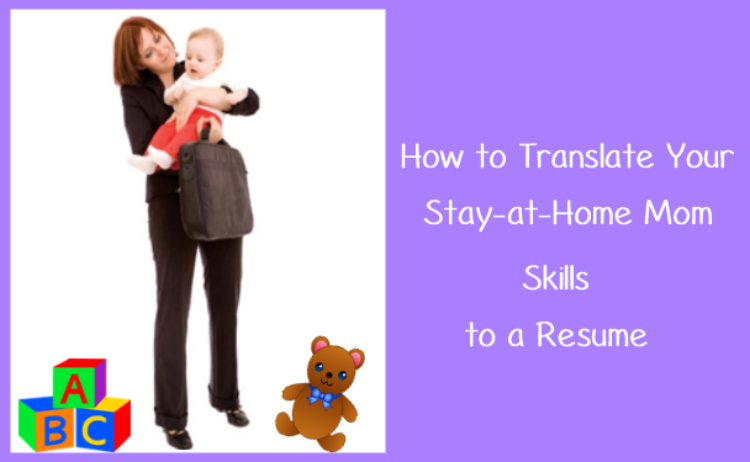 Avoid terms like stay-at-home mom and use something like household manager. Get a list of references from teacher’s you’ve helped, from church or anywhere else you’ve lent your skills to. Avoid using family members as a reference. Proofread your resume, and it would be a good idea to have someone else look at it before you begin distributing it. Remember a resume is a chance to brag about you so celebrate every accomplishment!